There is something so comforting about a really rich beef dish with a lush silky sauce. This one sounds, looks, and tastes extremely swanky but is almost ridiculously easy. I’ve served this with soft polenta but it works just as well with mashed potatoes. This recipe is also flexible enough to alter for small or large groups. For the red wine component in a Beef Bourguignon a lighter bodied Pinot Noir is traditional but you would drink a bigger bodied red, like a Cabernet Sauvignon or Bordeaux blend, when serving the meal as the firmer tannins cut the fat well in a rich meaty dish like this. Heat the olive oil & butter over medium heat in a heavy stock or sauce pot. Add the chopped bacon and cook for 2 minutes. Season the chopped beef with salt & pepper and add to the pot, stirring until browned- about 7 minutes. With a slotted spoon, scoop out the bacon & beef and dump in the onions and the garlic and cook for 2 minutes and then return the meat (and any juice from the plate) to the pot. Sprinkle in flour and stir well for a couple minutes. Add everything else EXCEPT the mushrooms and stir together. Cover pot and simmer on medium low for about 2 hours. Add the mushrooms and cook for an additional 10 minutes. 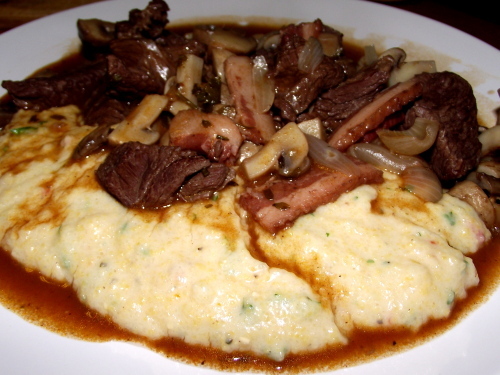 Remove the bay leaves and serve over mashed, soft polenta or rice. Enjoy!